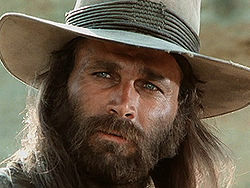 In “Mannaja” (A Man Called Blade) Mauirzio Merli is made to look a lot like Franco Nero. Even the theme music is similar to Nero’s “Keoma” score. In actuality that wasn’t the sole reason for casting him in the lead role. At the time, Merli was a huge star of police/crime films in Italy. He was 37 when this film was released. He died at age 49 after suffering a heart attack during a tennis match in 1989.